A breathtaking Newly Renovated Chincoteague Island Vacation Home that sleeps 8. Endless Summer is a stunning Newly Remodeled Vacation Home that sleeps 8. Located on the desirable East Side, Endless Summer combines the best of Modern Amenities and Historic Charm. Sit on the Front Porch with a glass of Sweet Tea & take in partial Chincoteague Channel Views. A wonderful place to begin and end all of your Beach Days - you`ll even have glimpses of the Lighthouse. Enter thru the spacious Mud Room, which also houses a Brand New Washer & Dryer. The interior of Endless Summer has undergone a total renovation - it is just like new. The Gourmet Kitchen is a dream with Granite Countertops & High End Stainless Appliances. Well-Stocked with all you need to make mealtime a bay breeze. Endless Summer kept all you love about Chincoteague Historic Homes, and added the refined touches you want and need. Curl up with the Gas Fireplace on chilly off-season nights. There are few words that encompass the beauty of this incredible Home. The Brand New Handmade Dining Table is exquisite. The rich, newly refinished Hardwood Floors are simply stunning. You`ll never want your stay at Endless Summer to end. Comfy, over-sized Furnishings, Free WiFi, and Flat Screen Cable TV are welcoming in the Living Area. Even the Half Bath just off the Living Area is a work of Art. There is a darling Screened Porch on the back of the House. What a great place to share stories of the day`s adventures. As you wander to the 2nd floor, you`ll find 2 spacious Bedrooms and even more charm. Bedroom 1 has a Queen Bed & is adorned is Pale Grays and Bright Beachy White. Antique touches with a Modern Flair are serene & comforting. Full Bath 1 on the 2nd Floor is STUNNING with Hardwood Floors & a spectacular Custom Walk-in Shower. Historic Wood Trim & Custom Marble Countertop are just perfect together - no detail was missed. Bedroom 2 has a Queen Bed and Views of the Chincoteague Channel & Assateague Lighthouse. Endless Summer sleeps 8 in style & elegance. The furnishings are the perfect blend of Old World Charm and Modern Comforts. The Master Bedroom on the 3rd Floor possesses a beauty hard to put into words..... Your own Private Retreat awaits you..... A Serene Escape with a comfy King Bed & Channel Views..... This space is newly created and a dream come true - Custom safety railing for stairs is on the way & will be here this winter. The attention to detail in this home is incredible. Experience beautiful Sunsets.... Sunset from the Master Bedroom. There`s no Sunset like a Chincoteague Sunset. And another beyond gorgeous Custom Master Bath that is more of a Work of Art. Assateague National Seashore is wild & free, just like our Ponies. There is nothing like a Chincoteague Sunset over our famous Oyster Beds. Our beautiful Beach is one of the most highly regarded Wildlife Refuges on the East Coast. Visit our Wild Ponies at Assateague.... Endless Summer is located just across the Channel and has glimpses of the Assateague Lighthouse. In Life, it's not where you go, but who you travel with. Family, Friends - those who mean the very most - are at times the hardest to get together. It's time - clear your calendar, grab those you love, and head to fabulous Chincoteague Island. And there is no better place to relax & reconnect than newly renovated Endless Summer located on the ever-popular East Side. This phenomenal Home combines the very best of yesteryear with stunningly beautiful style & the Modern Amenities you want and need. Endless Summer was built in the 1930's with all the Chincoteague Charm of that era, but absolutely everything inside and outside is Brand New this season! Endless Summer is tucked back on Pointer Lane, facing the Chincoteague Channel with peeks of the Bay and Assateague Lighthouse from the upper levels. 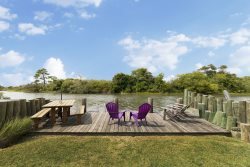 Stroll down Pointer Lane, and you're at the Public Boat Launch, making this home an ideal location for Boaters & Kayakers - you can even try your hand at fishing and crabbing from the dock! And there's plenty of parking at the house, so bring your boat! This gorgeous Home is located on one acre, so there's plenty of room to run & play. As you enter Endless Summer, your jaw will drop - the Owners have lovingly restored and refinished this Historic Home, while keeping all of its charm and personality. You can almost feel its history. Enter through the Mud Room, which houses the Full Size Washer & Dryer - kick off your Flip Flops, and let the fun begin! The Chef in your family will adore the Gourmet Kitchen with gleaming Granite and high-end Stainless Appliances. Enjoy a quick breakfast at the Breakfast Bar or relax with the whole family in the Dining Area. Enjoy the breeze off the Bay while grilling the Fresh Catch of the Day and dine Al Fresco in the picnic area! So many options.....and of course, many Dining options are only minutes away. After a fun-filled day at the Beach, relax in the Living Area with huge Flat Screen Cable TV & Free WiFi. Oversized, comfy furniture is wonderful to sink into, and there's even a cozy Fireplace for those chilly Off-Season Stays. Just off the Living Area is a convenient Half Bath - even this room is like a fine piece of Art! Endless Summer's quaint Front Porch is the perfect place to enjoy your morning coffee as the Island comes to life. End the day on the Screened Porch facing the peaceful backyard sharing stories of the day's adventures. This Dream Home sleeps 8 comfortably in 3 Bedrooms and there is a large Sectional Sofa in the Living Area that can be used to sleep 2 people. Wander upstairs to find Bedrooms 1 and 2 which have brand new comfy Queen Beds and lovely antique furniture. The Pale Grays and Blues against the Rich Hardwood Floor is striking. The Full Bath on this level has Marble Countertops and a Custom Tile Shower that is nothing short of luxurious. Catch glimpses of the Bay and Lighthouse from the upper floors, and be sure to take in Sunset at Endless Summer - beyond beautiful! The Master Suite, located on the 3rd Floor, is a Retreat, indeed. Encompassing the entire upper level, there is a King Bed situated such that you can sit up in the morning and take in gorgeous Views. So many special touches, such as the Barn Doors created with repurposed wood from Endless Summer. The Master Bath is adorned with an Antique Vanity with very Modern Sink, and the Walk-in Shower is yet another work of Art. **Traveling with a large group or family reunion? Rent Endless Summer, Les Bon Temps, and Rhythm & Blues - all located on Pointer Lane just steps apart! Seaside Vacations does not allow group rentals to guests under age 25 or Bachelor/Bachelorette Parties. Therefore, online bookings for group rentals will not be honored.